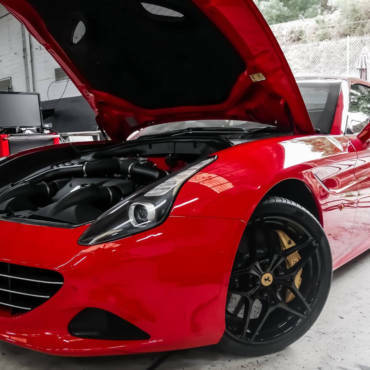 The Ferrari California is special to earlier Ferrari models because it uses a direct injection engine to comply with strict Californian environmental regulations. Even though it is a limited production supercar and does not have to adhere to some of the restrictions posed on ordinary production models, this feature makes it unique. It allowed it to get registered on almost any place in the world. When you are a Ferrari owner, you want your favourite toy to be where you are and not vice versa. This is a very well made naturally aspirated engine. The Rev limiter is increased by 300rpm to gain top end power. Because it complies to CARB and Euro regulations, mid rpm is a little bit lean compared to what we would have wanted it to be. By making it right by our own standards, the engine gains more torque. Further modifications are done to the ignition mapping to improve power. Torque model tweaked to provide more direct response from the throttle.